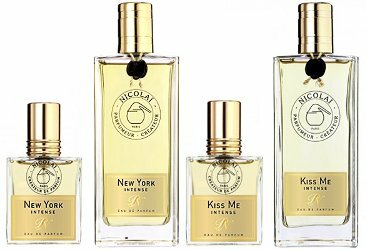 French niche line Parfums de Nicolaï has launched two new fragrances in their Intense series: New York Intense and Kiss Me Intense. New York Intense ~ a flanker to 1989's New York. "A classic from NICOLAI now available in INTENSE version! Like the city that never sleeps, the fragrance stimulates and spices up the life of those who wear it. Red and black pepper, patchouli and citrus notes compose this spicy amber fragrance acclaimed by the critics." Parfums de Nicolaï New York Intense and Kiss Me Intense are available now at Luckyscent in the US, in 30 ml ($65) or 100 ml ($185) Eau de Parfum. Interesting — I love and own Kiss Me Tender but I already find it a pretty strong and long-lasting scent. Intense sounds a little intense! I agree. But maybe it’s just a different interpretation? Wonder if they’ve made it less “pastel”? Don’t know, but I”m intrigued…I liked that one. Interesting – isn’t it New York the one that Luca Turin mentions in Perfumes: the Guide as not working in EdP (according to De Nicolaï herself) because it was “too squat”? She must have worked out that problem. I have to say, though, that I don’t find Sacrebleue Intense any more intense than the original. Maybe this is just a way of re-working these classic scents for the new regulations and with the materials available. Ack…I remember the “squat” discussion, the term has always stuck in my mind as a great way to explain why every light scent can’t be made more intense without seriously changing its character. But can’t remember which scent it was about. New York is quite a bold scent. Not as “dense” as Kiss me Tender, but it has a lot of presence. I will still want to smell them; Mme De Nicolaï is one of my perfume heroes. Hero, yes. But if I had a complaint about New York, (I don’t), it would not be that it needed intensification. I myself have no complaint about New York. Of all the fragrances my husband has worn over the years (which is to say, all the fragrances I have bought for him), New York is my favorite. I think he is due for another bottle about now, and I will probably get a sample of the intense version to compare. Hmm. Kiss Me Intense is a pretty awesome name, and I liked the original. HMMMMM. Yay for a 30ml size. I really liked Kiss Me Tender when I got a sample last year, even though I usually can’t handle a lot of anis in my perfumes. This version sounds so sniff-worthy and I’m glad I fought off the temptation to buy a small bottle of the original KMT so far in case I like the Intense even more than the original. Thanks for the heads up. In fact, I was one of the Monday Mail customers and I was suggested to try New York, which I did, and which I loved. Parfums de Nicolai has some truly good fragrances reasonably priced, and New York is certainly one of their best! I hope at some point they will come up with a more EDT of Sologne, my favourite orange blossom cologne.